I greet you in this Lenten time, on the occasion of the course on the Internal Forum, which this year reaches the thirtieth edition. And I would like to add – outside the text – a word on the term “internal forum”. This is not a nonsense expression: it is said seriously” The internal forum is an internal forum, and cannot come out into the open. And I say this because I have realized that some groups in the Church, appointees, superiors, let us say – mix the two things and take decisions made in the internal forum for those taken in the external one, and vice versa. Please, this is a sin! It is a sin against the dignity of the person who trusts the priest, who expresses their own reality to ask for forgiveness, and then uses it to put things in order for a group or a movement, perhaps – I don’t know, I am making it up – perhaps even a new congregation, I don’t know. But the internal forum is the internal forum. And it is sacred. This I wanted to say, because I am concerned about this. I address a warm greeting to Cardinal Mauro Piacenza, Major Penitentiary, and I thank him for the kind words he addressed to me. With him, I greet all the family of the Apostolic Penitentiary. The importance of the “ministry of mercy” justifies, demands and almost imposes an adequate formation, so that the encounter with the faithful who ask for God’s forgiveness may always be a real encounter of salvation, in which the embrace of the Lord may be perceived in all its strength, capable of changing, converting, healing and forgiving. Thirty years of experience of your Course on the sacramental Internal Forum are not many compared to the long history of the Church and with regard to the antiquity of the Apostolic Penitentiary, which is the oldest Tribunal in the Pope’s service: a tribunal of mercy! And I like it to be this way. However, thirty years, in this time of ours, which passes so quickly, are a long enough time to be able to reflect and arrive at a balance. In addition, the very high number of participants … this year, more than seven hundred! The cardinal said that he had to stop enrolment for logistical reasons! It seems like a job that there is no space in the Vatican! It seems a joke! [The very high number of participants] indicates how acute the need for formation and security is, with regard to matters so important for the very life of the Church and the fulfilment of the mission that the Lord Jesus has entrusted to her. While it is held by many that Confession, and with it the sense of sin, is in crisis – and we cannot fail to recognize a certain difficulty of contemporary man in this regard – this extensive participation by priests, newly ordained and ordinands, testifies to the continuing interest in working together to face and overcome the crisis, primarily with the “weapons of faith”, and offering an ever more qualified service capable of truly manifesting the beauty of divine Mercy. Jesus came to save us by revealing to us the merciful face of God and drawing us to Him with His Sacrifice of love. 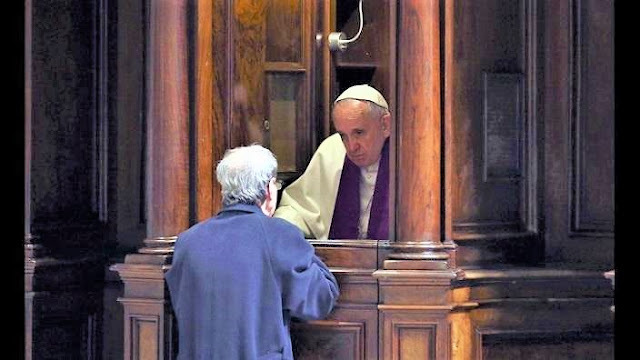 Then, we must always remember that the Sacrament of Reconciliation is a real way of sanctification; it is the effective sign that Jesus left to the Church so that the door of the Father’s house would always remain open and that the return of men to Him was always possible. Sacramental Confession is the way of sanctification both for the penitent and for the confessor. And you, dear young confessors, will soon have experience of this. For the penitent it is clearly the way of sanctification, because, as was underlined several times during the recent Jubilee of Mercy, sacramental absolution, validly celebrated, restores to us our baptismal innocence, the full communion with God. That communion that God never interrupts towards man, but which man sometimes removes by using badly the stupendous gift of freedom. For the meeting with the priests in my diocese, this year they chose as a motto “Reconciliation, sister of Baptism”. The sacrament of Penance is the “brother” of Baptism. For us priests, the fourth sacrament is the way of sanctification, first and foremost when, humbly, like all sinners, we kneel before the confessor and implore divine mercy for ourselves. Let us always remember – and this will help us greatly – before going to the confessional, that we are first of all forgiven sinners, and only then are we ministers of forgiveness. Furthermore - and this is one of the many gifts that Christ’s love of predilection holds for us – as confessors we have the privilege of constantly contemplating the “miracles” of conversions. We must always recognize the powerful action of grace, which is capable of transforming the heart of stone into a heart of flesh (cf. Ez 11: 19), of changing a sinner who fled far away into a repentant son who returns to his father’s house (see Lk 15: 11-32). For this reason the Penitentiary, with this Course on the Internal Forum, offers an important ecclesial service, favouring the necessary formation for a correct and effective celebration of the sacrament of Reconciliation, an indispensable prerequisite for its fruitfulness. This is because every single Confession is always a new and definitive step towards a more perfect sanctification; a tender embrace, full of mercy, which helps to expand the Kingdom of God, the Kingdom of love, truth and peace. Reconciliation itself is a good that the wisdom of the Church has always safeguarded with all her moral and legal force with the sacramental seal. Although not always understood by the modern mentality, it is indispensable for the sanctity of the sacrament and for the freedom of conscience of the penitent; who must be certain, at any time, that the sacramental conversation will remain in the secrecy of the confessional, between one’s conscience that opens to grace, and God, with the necessary mediation of the priest. The sacramental seal is indispensable and no human power has, nor may it claim, jurisdiction over it. Dear young priests, future priests and dear Penitentiaries, I urge you to always listen with great generosity to the Confessions of the faithful, to walk with them the way of sanctification which is the sacrament, to contemplate the “miracles” of conversion that grace operates in the secret of confessional, miracles of which only you and the angels will be witnesses. And may you sanctify yourself above all, in the humble and faithful exercise of the ministry of Reconciliation. Thank you for your service! And remember to pray for me too.